Rates can now not go much lower, government introduces "quantitative easing"
LONDON, England (CNN) -- The UK government has announced plans to introduce "quantitative easing" to help the economy. 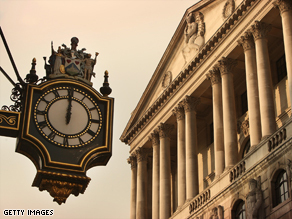 UK interest rates are at their lowest levels since the Bank of England was founded in 1694. Isn't this what some commentators have called "printing money?" Um, yes. Up to a point. Does this mean the UK government will have its printing presses working overtime? No, not quite. Printing more money can result in disastrous hyperinflation, from which Zimbabwe has suffered in recent years. Last month Zimbabwe was forced to slash 12 zeroes from its currency. Before then, a 100 trillion dollar note was insufficient to buy a loaf of bread, with one U.S. dollar worth around 300 trillion Zimbabwe dollars. As of last July the official inflation rate was at 231 million percent -- although international observers estimate it to be much higher. Businesses in Zimbabwe are reluctant to accept a currency whose value dramatically shifts by the day, while the value of assets can be wiped out overnight. So, printing money: very bad idea. So what is "quantitative easing" then? The UK government wants to encourage banks to lend funds again to each other as well as to individuals and business. The plan is that the Bank of England will "create" more money on its balance sheet, then use this to buy banks' assets such as home loans and government bonds, pumping extra cash into the system. The banks all have accounts with the Bank of England, and the money will simply be credited to those accounts. It's all done electronically. How have we reached this point? International economies have been hit hard by the current recession. Many banks and financial institutions have bad loans on their books -- sometimes known as toxic debts -- which are affecting their balance sheets. Money markets have frozen or are falling and lending has stopped. Economies have seized up and need a kickstart. What have governments done about the situation? Central banks such as the U.S. Federal Reserve, the Bank of England and the European Central Bank have tried to encourage spending and lending by cutting interest rates. But it doesn't seem like the economy is responding. The Bank of England interest rate was cut from one percent to 0.5 percent Thursday -- a drop of five percent since October last year. Rates are now at their lowest in the bank's 315-year history. There's not much further for them to fall. The UK government felt it needed to consider another strategy -- hence the announcement about quantitative easing. Has quantitative easing been tried anywhere before? The Japanese economic bubble burst during the 1990s, resulting in deflation around the turn of the century. Consumers, already hit by the recession, were wary of making purchases, thereby adding to the economic woe. The bank cut interest rates to zero and, then in 2001, introduced quantitative easing before ending the policy in 2006. The Japanese economy recovered, although expert opinion is divided as to whether quantitative easing helped with anything other than improving sentiment. Is it likely to work now? This is the great unknown. Supporters say it should -- and that there is little alternative given how interest rates have failed to have any effect up till now. But the current downturn has taken many financial institutions into unknown waters, with household names needing government bailouts and some banks even sinking. Perhaps the greatest barrier to success is psychological: that banks, already running scared, simply play safe and sit on their new cash flow.